It’s been an AGE since I wrote a post for this blog. 2012 has been, without question, the nuttiest year of my life, and it’s only the start of May. In the last four months I have: published a novel; gone on tour to promote said novel; become an American citizen; got divorced; bought a house. And in between all that I have been running my law firm and parenting my lovely children. What I haven’t been doing very much of is writing. When I am writing, I need space – of both the literal and metaphorical variety. I have not had much of either recently. There has been so much going on – struggling to survive the emotional shrapnel of the divorce in particular – that I have been unable to sit down and dive into the story that is swirling around my head (and in a plethora of notebooks.) And the rented condo where I’ve been living for the past year had nowhere I could call my own for me to write. This creative logjam – I refuse to call it writer’s block – has been slowly gnawing away at me and is, I suspect, largely responsible for much of the gloom that has been afflicting me of late. Writing is hard, hard work, but it is also an escape, and immeasurably rewarding (when it goes right, anyway.) It is also what I do, who I am. Being unable to tell stories is a bit like cutting off a limb – suddenly I’m a little less the person I was. A couple of weeks ago I bought a house. It’s lovely – it has a beautiful kitchen and a gorgeous garden – and it already feels like home. But the photo at the top of this post is what really attracted me to the place. I now have my very own nook, where I can shut myself away from the rest of the world and write my heart out. Just as importantly, the new house represents a fresh start for me. I have been treading water for the past year, really just trying to keep afloat, but now it is time to strike out for new horizons. It’s time to take my finger off the pause button and start moving again. Which means, of course, that it’s time to get writing. So this morning I set my alarm for 5 o’clock for the first time in months, hauled myself out of bed, fixed a coffee, and sat down at my computer. Admittedly, I’m writing this post first, and then I have to complete a piece for NPR’s All Things Considered, but my new novel is now at the forefront of my thoughts, demanding my attention. Last week I signed a contract with Amy Einhorn Books to publish the book. This is exciting news, but one of the things about publishing contracts are these pesky things called deadlines. I have until February 2014 to deliver my manuscript. So far I have written three chapters. Given that it took me seven years in total to write A GOOD AMERICAN, I obviously have my work cut out. So it’s time to roll up my sleeves and get to work. I’m so happy for your fresh start, and honestly, a little in awe. You didn’t break under the pressure. You have a new beginning. I have no doubt you will flourish. Much good luck to you. 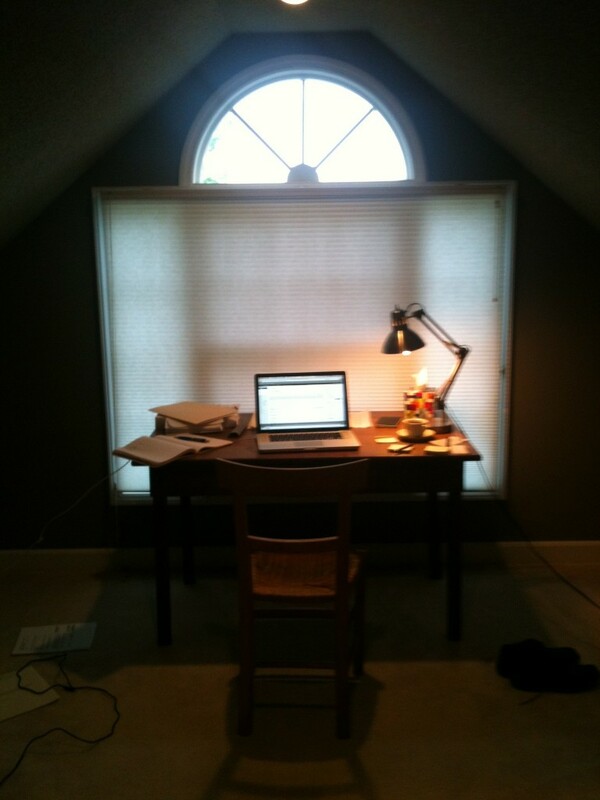 Congratulations on being ready to continue on this fresh path , and I do covet your writing nook! Congratulations on the contract, and good luck writing the next book! I’m glad you have your own space in which to write, and look forward to reading what you write in the new house! Thanks, all. It’s a long road ahead, no doubt about it, but I am relishing the challenge. I’m going to try and post more regularly as well, now that the madness has abated a little. I think you have handled it all very, very well. You are indeed embarking on a new life and I hope you find the happiness you so deserve. A new home is a great start! 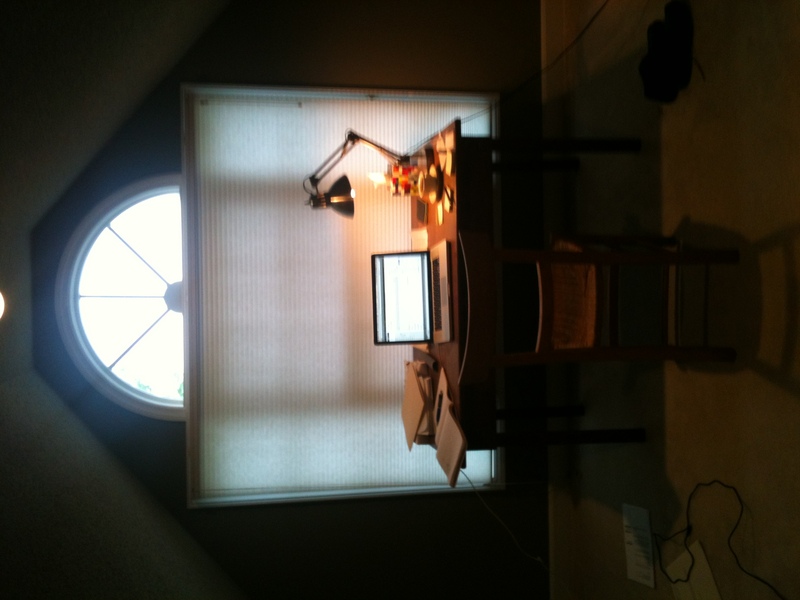 Your writing space looks just perfect! I look forward to reading more posts–we have missed you!